Do you love food? Do you get excited about new food trends and creative recipes? When you travel, do you first explore a list of restaurants before you even find a hotel or decide which attractions to visit? I do, and I know I’m not alone. My Instagram feed is proof. I love photographing food, eating new foods, learning the story behind the food, and talking to people responsible for the food I eat, whether it be farmers, producers or chefs. Cooking is my form of relaxation and I get a kick out of hanging out with people who love food just as much as I do. For some people food is merely sustenance. That’s ok. You have other interests. But, this post is not for you. This post is for foodies. 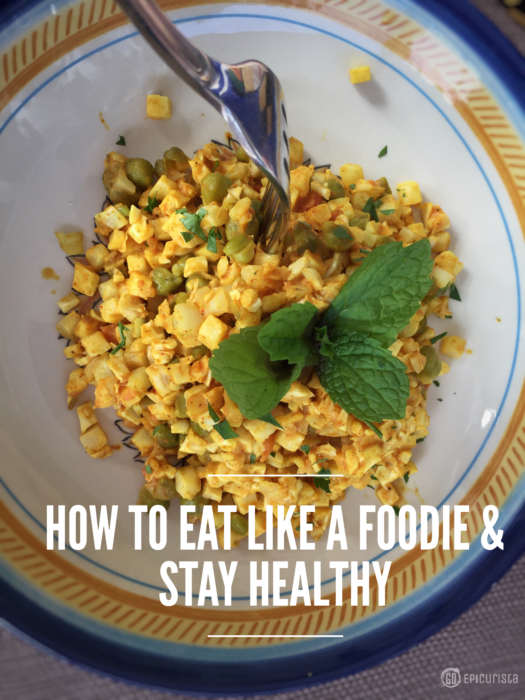 This post is for people who want to eat like a foodie and stay healthy. According to Merriam-Webster dictionary, “a foodie is a person who enjoys and cares about food very much. A foodie is a person having an avid interest in the latest food fads”. If that sounds like you, then this post is for you. Contrary to popular belief, you don’t have to know a lot about food to be a foodie. Some people are snobs about food and they have been confused as foodies. The term may be overrated, yet no one has been able to come up with an alternative that best describes people like us. People who take pleasure in enjoying a good meal, a creative food pairing, an inventive plate presentation. Unfortunately, People like us often struggle with keeping the pounds off, living healthy and staying fit. Let’s face it, when you like to indulge, it is easy to overdo it. But, I’m here to tell you it can be done. 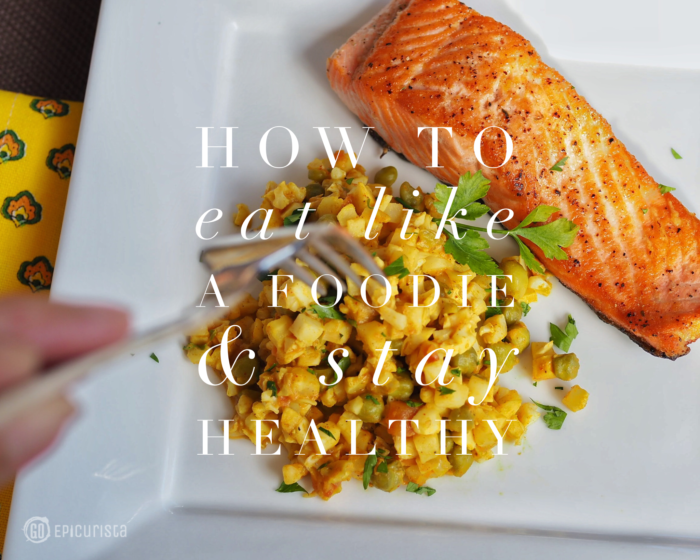 You can eat like a foodie and stay healthy. Staying fit is also possible and you can read my tips to Eat Like a Food Blogger and Stay Fit as a reference. My goal is to live a Foodie Fit Life! I don’t always succeed. I still have 10 pounds I want to get rid of and time to shave off my running PR. But I keep learning, looking for new ways and consciously developing habits that will help me continue to live the life I want in a way that is not restrictive. Life is too short for that. The tips I share with you below are devised from these experiences and what has worked for me. I am not a doctor or a nutritionist. I am a professional food travel writer and blogger who is always eating out – from new restaurant openings to multi-course wine dinners, charity galas and events. Those meals blow my caloric budget in one sitting. I am always in a rush. If I’m not out eating and exploring, I’m sitting at my dining room table, in front of the computer, writing and doing a million tasks required to run a website and be a digital influencer. This. All of this, is not a good recipe to stay healthy and keep the pounds off. When you’re on the go it’s easy to grab the first thing you find to eat, and that is not usually a healthy option. Quick and healthy are hard to come by. When you’re working from home, you’re sitting and it’s easy to reach for an unhealthy snack out of the pantry and snack mindlessly all day. I think you get the picture. The odds are stacked against us foodies to stay healthy. Diets don’t work for foodies. Diets are restrictive and often repetitive. Who could be excited about eating baked chicken and steamed broccoli every night, or cabbage soup every day? How do you go out to eat with friends and be the one asking for a plain green salad with dressing on the side and a plain piece of chicken? It’s impossible. There’s a part of our mind and soul that’s turned off by that. And that’s why diets fail. Instead, here’s how to eat like a foodie and stay healthy. Now you may think I’m crazy. How can I eat like a foodie and enjoy all the amazing foods of Instagram – from killer burgers, giant doughnuts, high-rise ice cream cones, churro cones, and bacon – and stay healthy? Especially when most foodie fads are incredibly indulgent and fattening and so difficult to resist. Here’s the answer, you don’t resist. You sample. You indulge. As long as you don’t have dietary restrictions and allergies, it’s perfectly fine to enjoy these guilty pleasures, in moderation. Balance is key. When I’m going out to a new restaurant or event at night, I eat a lean, veggie packed breakfast and lunch that day. I sample every dish put in front of me but I don’t finish it. And I always enjoy every bite. If you feel guilty about it, what’s the point? Live, enjoy and follow these tips below to eat like a foodie and stay healthy. 1. Live in Color. Eat in Color! “The more color in your life the happier you’ll be” my sister would say to me. She referred to my mostly black wardrobe, but I applied it to food instead. She was right. Colorful food does make me happier! It’s no secret, we eat with our eyes. Color pops! It makes the plate visually stunning. This is where foodies can’t resist pulling out their phone to take a picture of their plate. 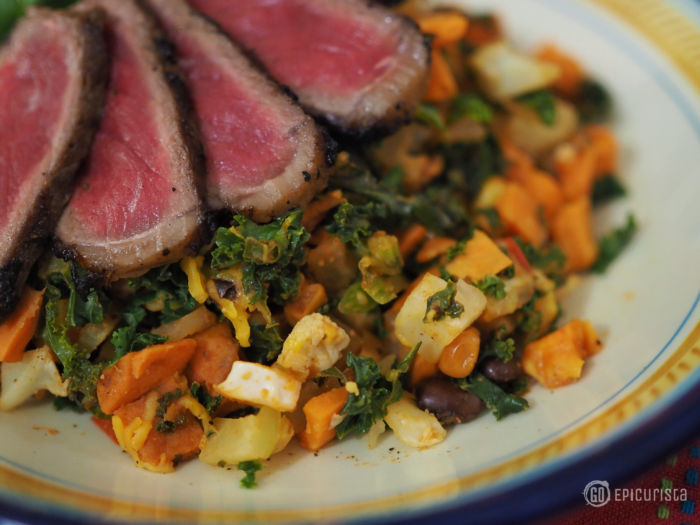 A colorful plate in front of you is much more exciting. This is where lots of veggies come in. The more veggies, in every color of the rainbow, the prettier your plate and the healthier the meal. I love that Mann’s Nourish Bowls are full of color. Green and orange vegetables especially are full of vitamins and nutrients. 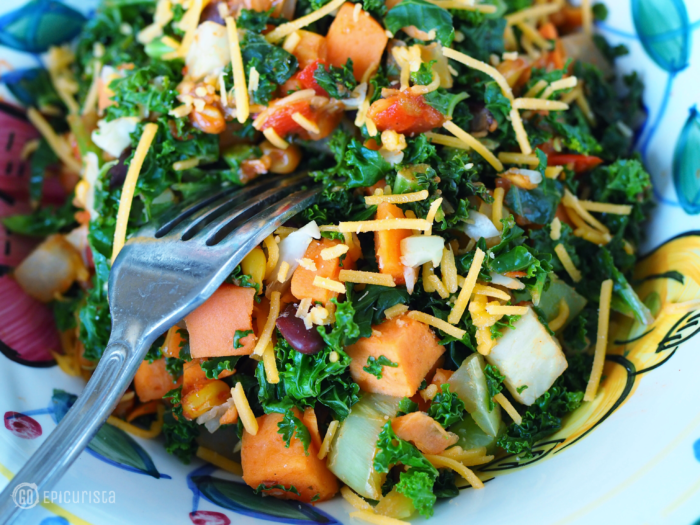 Think spinach, broccoli, kale, Swiss chard, sweet potato, carrots, butternut squash, and peppers. 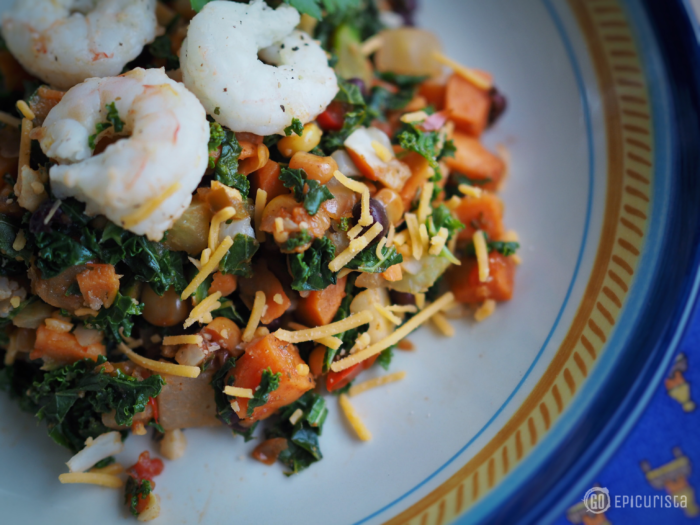 The Southwest Chipotle bowl with sweet potatoes, yellow corn, black beans, kale, kohlrabi, cauliflower, and tomato salsa was not only fun it was tasty. Cauli-Rice Curry with green chickpeas and that beautiful curry yellow color was stunning. You can eat these straight from the packaging but unless you’re on the go, I prefer to plate it on a pretty plate, add some fresh herbs and make it look like a restaurant meal. I guarantee you’ll enjoy it more. When you love food, it’s easy to over indulge. This is why it’s important to watch your size, portion size that is. When I go out to eat, I prefer to share meals (and calories) with friends. Plus, I never finish a full plate. I’m often walking out with a doggy bag for lunch the next day. At home, I use the palm of my hand as a guide to measure my proteins (they say it’s equivalent to a deck of cards but who has a deck of cards around all the time?) 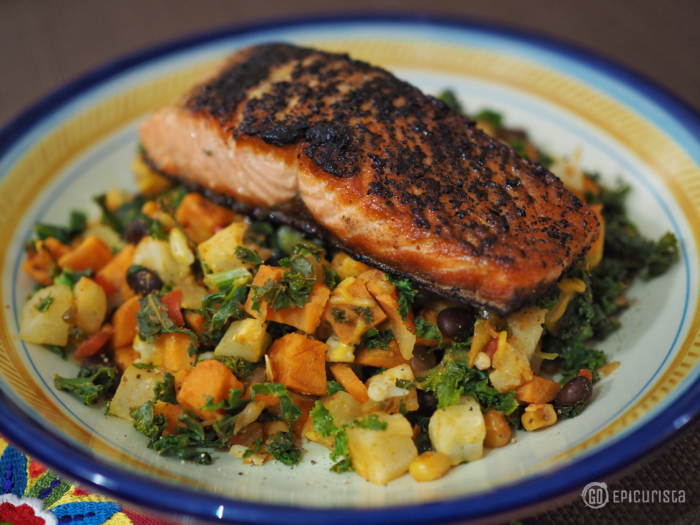 According to the American Heart Association proteins should be around 3 oz and grains and pastas at around ½ cup. The good news is that veggies don’t really need to be measured so use those to fill you up. 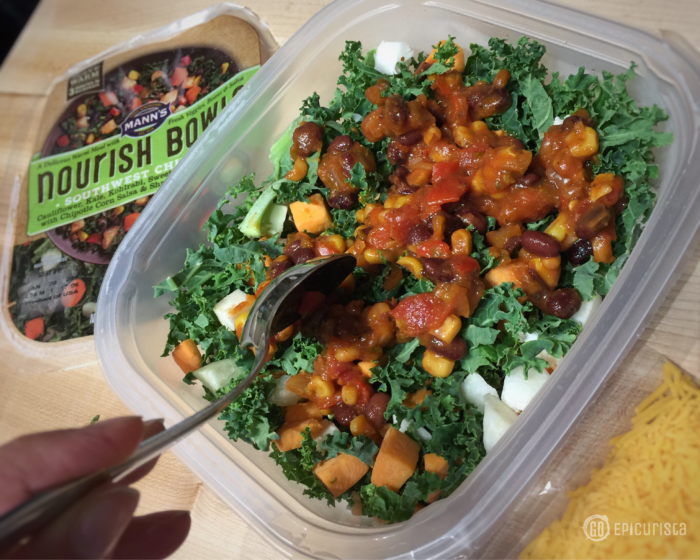 Nourish Bowls are perfectly portioned for one single-serve meal, which is awesome if you’re in a hurry to get a meal ready or you’re on the go. One bowl was actually more than one portion for me so I shared part of it with my husband. Each bowl only takes 3-4 minutes in the microwave and ranges in calories from 220-420. For lunch, I topped it with leftover proteins from dinner the night before. For dinner, I grilled chicken, lean beef like a strip or sirloin, shrimp, salmon or scallops seasoned simply with garlic salt and pepper. The sauces that come with the bowl were flavorful enough, I only added some fresh cracked pepper. It was easy, tasty and quick. You’ve heard of Meal Prep? If you can master it, then my hat is off to you. You are in a great position to eat like a foodie and stay healthy. As much as I try, it hardly ever happens in my house. At least not in the way most would intend with a planned menu of new recipes, a detailed shopping list and pre-packaged portions. Juggling deadlines and a multitude of projects, travel schedules, and last minute invites to new restaurant openings, I don’t always know when I will be eating at home. My husband or I usually head to the grocery store in a rush and pick up the same staples we eat every week. 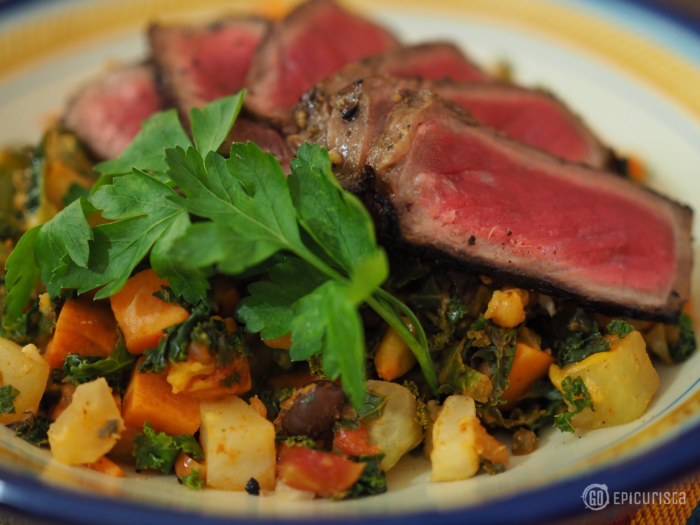 Our meals consist mostly of grilled meats, fish or chicken, veggies and salads with lots of spices. It’s not ultra exciting but this is part of balancing healthy eating at home with indulging when eating out. 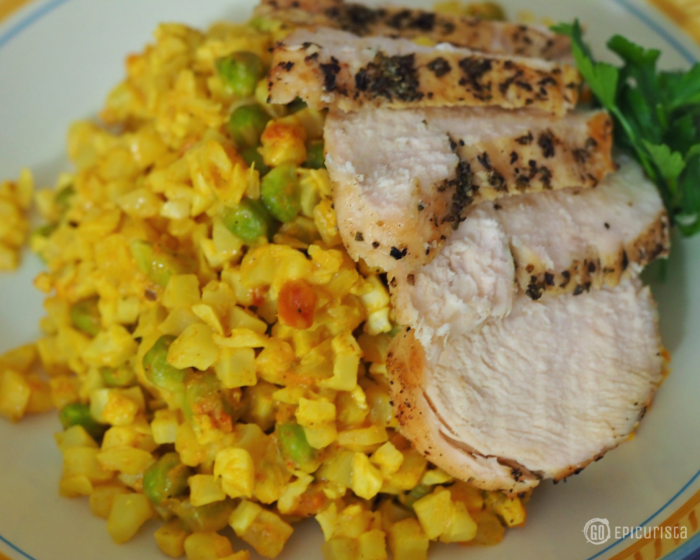 A few things that work for us is buying larger packages of chicken breasts and salmon. We vacuum seal small bags of two portions and freeze, then each day we are eating at home we will pull one out of the freezer to make that night. If I know I will be home the following day for lunch, we will grill an extra portion to have for a quick lunch the next day. Adding this already cooked protein to the Nourish Bowl was perfect for a quick warm lunch with fresh veggies, grains and sauce. Best of all, it was ready in under 5 minutes total! I also liked that the bowls had all the veggies chopped and ready to go, and the sauce packet inside. This takes meal prep to a whole new level. Easy to Prepare. Just add the sauce packet, mix and microwave! As a foodie, I like to try new foods, new combinations, new spices, sauces and food preparation techniques. It keeps food interesting. This is where those crazy food fads come from. A bored foodie invented them! Incorporating different ingredients, vegetables and grains you don’t normally eat into your diet not only keeps it exciting it’s also healthier. You hear time and time again that balance is key, that eating too much of one thing is not good for you. Variety is the spice of life! So here’s a tip. Incorporate a new vegetable into your diet each week, try a new spice, and experiment with ethnic foods different from your own. Nourish Bowls feature a nice variety of vegetables I don’t normally purchase and had great sauces. Brussels sprouts, a foodie darling usually smothered in butter and bacon in restaurants gets a much healthier treatment with smoky sweet glaze mixed with brown rice, kohlrabi and kale in the “Smokehouse Brussels” bowl. 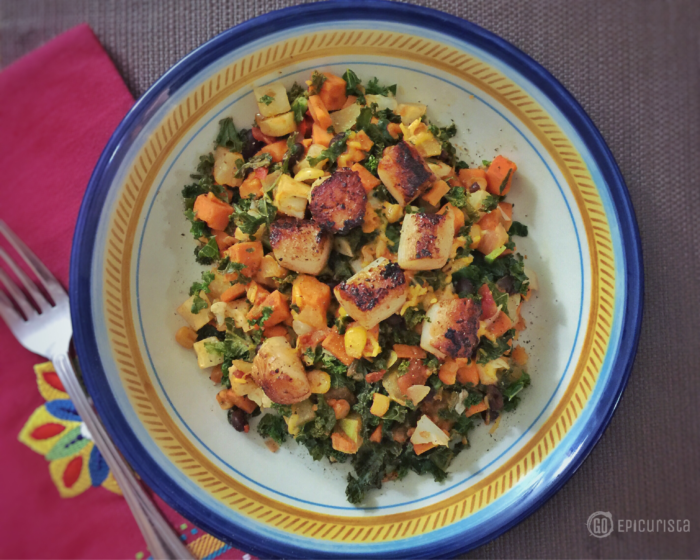 Kale, the superfood darling of the foodie world, ever since Gwyneth baked kale chips on Ellen in 2011 and Bon Appetit named 2012 the year of kale, is also in the Southwest Chipotle and Monterey Risotto. Cauliflower, now said to be “The New Kale” according to food trend prognosticators, is appearing in more restaurant menus and in more creative ways than just simply part of a “steamed vegetable medley”. Cauliflower rice has offered those of us avoiding / reducing carbs with a guilt-free rice option and it was delicious in the Cauli-Rice Curry bowl. The curry sauce had the right balance of spices. Their five bowl varieties provide a great variety of flavors from roasted garlic, to smoky glaze, to Sriracha, Southwest chipotle and curry. By adding different proteins, the possibilities are endless. The story behind your food is important. I have enjoyed meeting farmers, producers and chefs and sharing their stories. In turn it’s made me appreciate what I eat even more. It’s also encouraged me to eat healthier as the more you know the better choices you make. I was happy to learn Mann’s is a family owned and operated company for three generations, since 1939. The Nucci and Ramsey families own and work within several areas of the organization. Their CEO, the majority of the board of directors, and over 65% of its shareholders are women, certified by the Women’s Business Enterprise National Council (WBENC) since 2012 as a Women Owned business. That rocks! Often when we see packaged foods in the grocery store, we immediately think it’s a big faceless corporation. 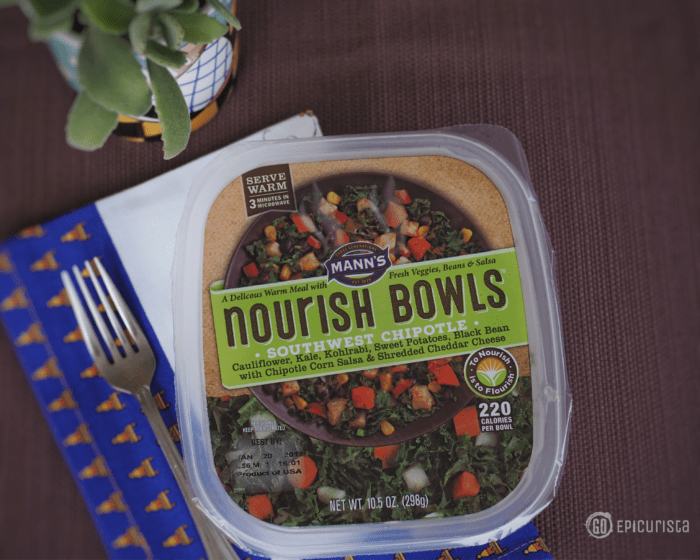 Learning their history and dedication to providing high quality ingredients was the reason I decided to join the Sunday Supper Movement and be part of the “Nourish to Flourish with Mann’s Nourish Bowls” campaign. 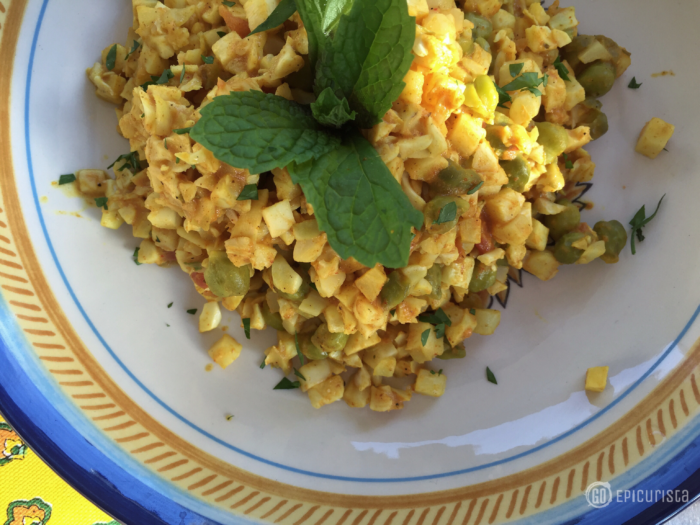 It was wonderful discovering this easy and nutritious way to create quick meals on the go that any foodie would love. You can learn more about Nourish Bowls by checking out their website and following their social media. Check out more ideas from the Sunday Supper Tastemakers on how these tasty bowls can fit into your lifestyle as well as recipes to make them even more exciting. 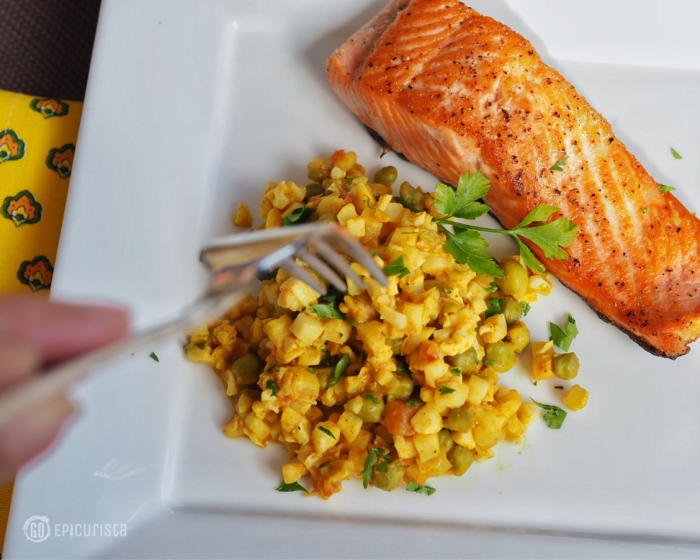 I am certain these ideas will help you eat like a foodie and stay healthy. good tips! and the Nourish Bowls definitely fit right into this approach. Thank you for stopping by Go Epicurista! I hope these tips will help you. Definitely Nourish Bowls have made it so much easier to be a foodie and stay healthy. Great tips! I share your pain as a food blogger it’s tough but we must be strong. The Nourish Bowls are wonderful! Yes! I find us food bloggers can stick together and help each other out sharing our struggles and our successes! 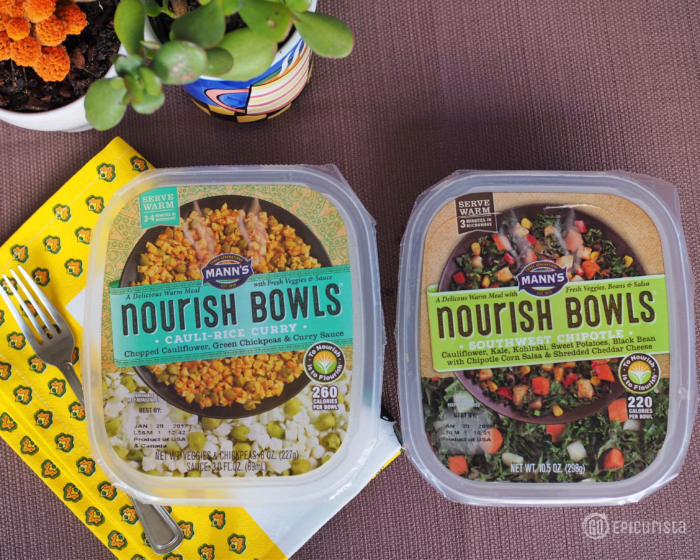 Nourish Bowls are now part of my grocery shopping staples. They are great! Great tips Christina! I agree 100 percent! Keeping calories in check is challenge for me too I need to taste everything before it’s served. If it is good, sometimes it gets “tasted” again! Oh yeah! I often taste again and again! That’s the fun part of cooking and eating out! But keeping calories in check is doable, especially when you have easy alternatives like Nourish Bowls. It’s true, foodies often struggle with weight! These are great tips to help keep it in check. Thanks for sharing! Thanks for checking out my tips! It is definitely a struggle but it doesn’t have to be as bad when we have great easy and tasty healthy products like Nourish Bowls. Great post Christina! Love all of your tips! Thank you so much! I’m so happy you found these tips helpful. Cheers to a happy healthy foodie fit life! I love your tips!!! I definitely need to plan better—when I don’t have a well rounded meal, I tend to finish it off with cookies. Lots of cookies!!! Thanks for the needed guidance!!! Oh yes! The first thing I reach for is ice cream! I hear ya! Thanks so much for checking out my tips. I hope they help you continue to indulge in your favorites and stay healthy. Cheers!